Today's theme for the Fall Fun Series is a fall recipe. I think it's supposed to be a bakery recipe, but I'm bending the rules. I don't eat a lot of sweets at home, so I made something that I would eat and fit my foodie needs. I love food as many of you know, and I love trying out new things. I was at Trader Joes last week and was trying to come up with a dinner idea. I saw these Sweet Apple Chicken Sausages and was contemplating how I could incorporate those into a dish. I then spotted some precut butternut squash and I had an "Ah ha!" moment. All I needed to figure out was how to season it, so this recipe I came up with is inspired by Carlsbad Craving's but I've changed a number of things so I'll share with you the recipe I came up with. 4. 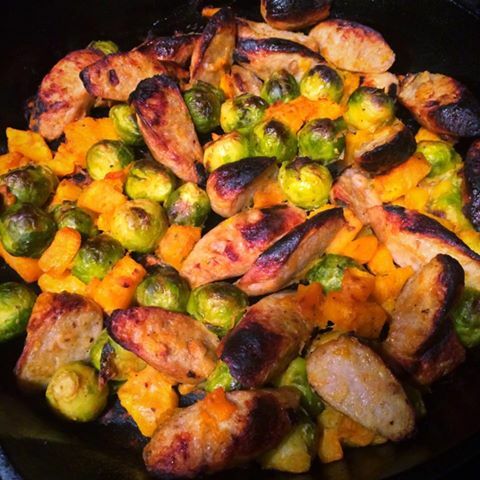 In a large bowl mix together your sausage, brussels sprouts, and butternut squash. 5. Add the Maple Dijon Sauce to your vegetable sausage mixture and toss until the sausage and vegetables are evenly coated. 6. Transfer your vegetable sausage mixture to a large baking sheet covered with foil and nonstick spray or an oiled cast iron skillet and spread the mixture until it is even. 7. Bake in the oven for 20 minutes, stir, then bake an additional 20-25 minutes until squash is fork tender. This turned out so delicious and was the perfect fall dish. This would go nicely with the apple salad I made previously. You'll notice they both have almost identical flavors! Check out my friends fall recipes in their posts today!